Use to help identify age, bloodline, broodiness, and differentiate birds within the same breed. 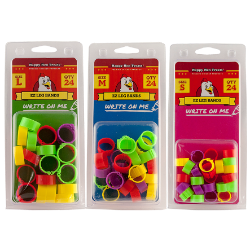 Colored identification bands are extremely useful at poultry shows, fairs, exhibits, and assists with telling your birds apart from nearby flocks. These EZ Leg bands are much easier to put on than traditional poultry leg bands! Personalize with UV resistant permanent marker for more specific identification. Sold in package of 24 leg bands. Fits most standard breed chickens around 2 weeks of age as well as full grown Bantam breeds, pheasants, and large pigeons. Typically fits Ancona, Araucana, Faverolle, Fayoumi, Hamburg, Lakenvelder, Leghorn, Mille Fleur, Polish, Silkie hens. Typically fits Ameraucana, Andalusian, Australorp, Barnevelder, Buff Orpington, Cochin, Cornish, Frizzle-Feather Legged, Jersey Giant, New Hampshire Red, Plymouth Rock, Rhode Island Red, Sussex, Welsummer, and Wyandotte hens. Sizing is based on female birds only, males may require larger size. Sizing is a guide only. Remove leg bands from growing birds if bands become tight. Bands should fit loosely enough to move freely on the leg.